Washington Wizards guard Bradley Beal passes the ball as Boston Celtics' Guerschon Yabusele and Jaylen Brown defend during the first half of a game Tuesday, April 9, 2019, in Washington. 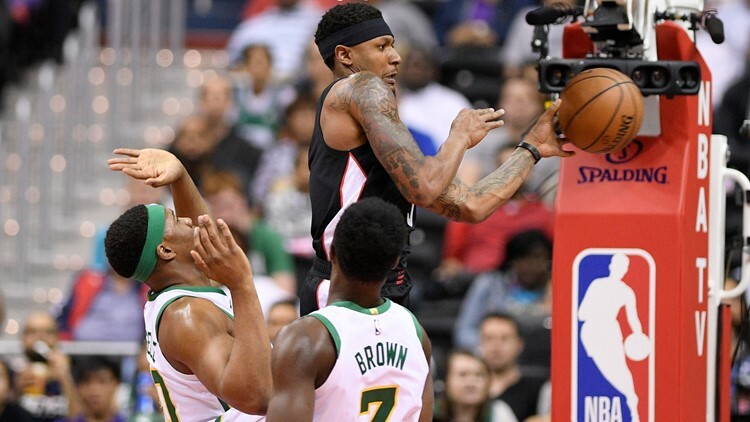 WASHINGTON — Bradley Beal became the first player in Washington Wizards franchise history to average at least 25 points, five rebounds and five assists for a season, reaching the numbers he needed in a 116-110 loss to the playoff-bound Boston Celtics in a finale Tuesday night that was meaningless to both clubs. Beal, a two-time All-Star, finished with 16 points, five rebounds and four assists - all before halftime - on Tuesday as he played in all 82 games for the second consecutive season. So there was no reason for Boston to care about the outcome Tuesday - or, therefore, use any of its best players. Seven prominent members of the roster were ruled out: Kyrie Irving, Jayson Tatum, Gordon Hayward, Al Horford, Marcus Smart, Aron Baynes and Marcus Morris. That group includes six of the top seven Celtics in scoring and assists, the club's six leading rebounders. Celtics: Rozier scored 21 points. Signed G Jonathan Gibson. He played four games for Boston last season. "He gets buckets," coach Brad Stevens said. Stevens, who led Butler to two runner-up finishes in the NCAA Tournament, was asked for his reaction to seeing coach Tony Bennett and Virginia go from last year's disaster - the first No. 1 seed to lose to a 16 - to this year's championship. "One of the coolest things I think I've seen in sports was Tony Bennett's reaction when they got beat last year and the way that he handled it," Stevens said. "And then to back that up with the year they had ... and for all those kids and for him and for everybody associated with the program to win all those games in the fashion that they did. ... Tony is a good friend and I am thrilled for him and for college basketball. I think he's about all the good stuff."